The east boat ramp at Carmen Reservoir is a god place to go practice your navigation skills. Due to the altitude and it being cold fresh water, there isn’t much in the way of life in the lake aside from some algae and a few fish but the wide space by the boat ramp is a good place to hone skills and practice altitude diving. The scenery is outstanding and well worth the trip on its own. The east boat ramp at Carmen Reservoir is a picturesque lake in the mountains outside of Eugene. We have used this site as a training site to practice navigation skills. Whether you’re practicing compass headings, kick cycle counts, trench search patterns, or more advanced navigation, this site is a good place to hone your skill set before going somewhere less forgiving. The dam is a good representation of Oregon coast jetties and can be used for practice entering and exiting over difficult jetty rocks. Or if you don’t want to work too hard, you can walk right on on the boat ramp and have a wonderful low stress dive. Bend, Eugene, and Salem are all about equally far away. There are a few small hamlets in between with limited services. Look for National Forest Road 750 (to the west) as you’re going along the Mc Kenzie River Highway. There are signs for the lake, the day use area further to the west, and the boat ramp. The last time we were here, parking was free and plentiful. As always, verify that the situation hasn’t changed when you go dive the east boat ramp at Carmen Reservoir. The Ice Cap Creek east boat ramp is a good place to practice navigation skills. This site is bounded by the dam to the south (it runs east-west), the road and shore to the north, the shore to the east, and a good marker for the western extent of the site is a protrusion of the dam that looks an awful like some of the fingers on the south jetty in Newport. You don’t want to go further west on the dam past the protrusion of rocks because you will get close to the water exit which is something you don’t want to get sucked into. You would have a very bad day indeed if you went through the business end of the dam. The boat ramp itself makes for a very easy entrance. There is another easy entrance a little to the east and south along the shore that is a simple step down into the water. Along the road on the north end of the site, you can scramble in/out on the bank if you really have to but there isn’t much reason to do that as long as your navigation skills are up to snuff. At the far northwestern corner of the site, you can climb out into a parking area that is part of the Ice Cap Creek Day Use Area although you will have a bit of a walk back to your car. 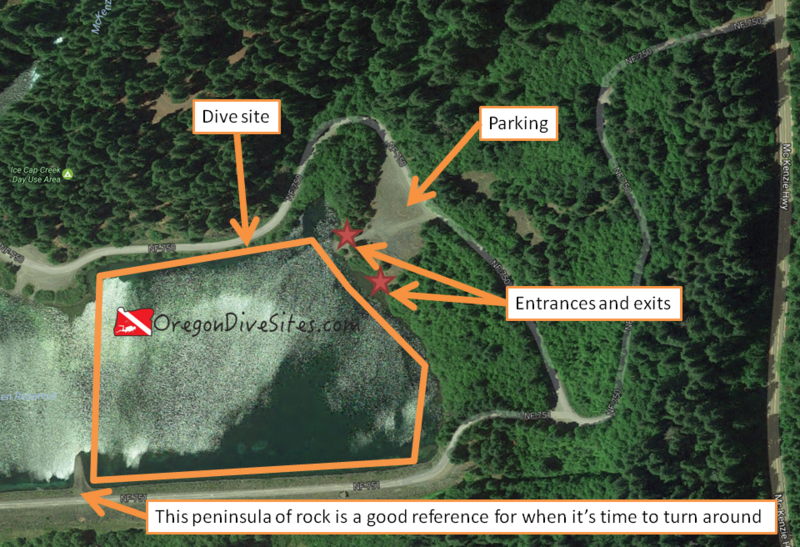 If you want to practice entering and exiting over a jetty structure, the dam on the south side of the dive site gives you that practice. Conditions during the summer and fall are usually pretty good here. The constant feed of cold fresh water keeps visibility fairly decent. Water levels can change rapidly depending on what the dam operator is doing. There can be boats in this area so it’s a good idea to fly a dive flag. We usually have between 15 and 30 feet of viz depending on the time of year and how much surface water runoff there is coming into the lake. The bottom can be stirred up so it’s a good idea to maintain neutral buoyancy. The water coming in from Ice Cap Spring is very cold. Near the creek, it can easily be 37F. In the summers, there can be a thermocline at the surface with a warm layer of water followed by very cold water at depth. This site is best done in the summer and fall. In the winter and spring, there is usually too much snow on the ground to access the lake. We found 55 feet here once without trying too hard. We suspect you can hit around 70 feet out in the middle. This is an altitude dive. An open water diver with altitude diver training can dive this site without a problem. Aside from the altitude dive aspect of this site, the east boat ramp at Carmen Reservoir is an easy place to dive. We have assisted with several training dives here in the past and enjoy this site for its easy access, its relatively benign conditions, and the chance to practice navigation. Depending on how close you can park, you might only need to walk 20 feet to be in the water. No surface swim is needed at the east boat ramp at Carmen Reservoir unless you’re bad at navigation and don’t monitor your air supply. Remember that this is an altitude dive. Boats can be at this site so it’s a good idea to fly a dive flag. We usually bring a SCUBA light with us when we dive the east boat ramp at Carmen Reservoir so we can look in all of the little crannies and crevices underwater to search for crayfish and trout. There aren’t any shops nearby. You’ll have to go to Eugene, Salem, or Bend to find a dive shop. You need to be self-sufficient diving this site. There is limited food service at Clear Lake but otherwise there aren’t any restaurants up here. The resort at Clear Lake has some cabins for rent that some of our SCUBA buddies have stayed at before. Otherwise there is plentiful camping in the national forest both in campgrounds and at primitive sites.